The Robus Black Star boilers consist of 2 specific options within various output variations. 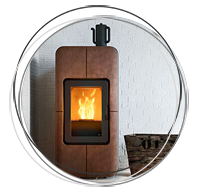 The most popular is the all-in-one compact version, which has the hopper attached to either the left or right side of the boiler depending on the measurements of certain space requirements and comfortability. The second option lets you select the boiler size you require and then attach a separate bulk hopper that will fit a larger amount of pellets in depending on the size. You must have a hopper with every boiler as shown below, but it will be your decision if you go with the compact all-in-one version, or the larger bulk hopper attachment option.